Original Pub. Date: Oct. 1, 2015. Last Update: Apr. 16, 2019. Westerners are not only known as history ignoramuses, but double dumbass history ignoramuses when it comes to bicycles and bicycle racing history. Since I'm the one-and-only Historyscoper (tm), let me quickly bring you up to speed before you dive into my Master Historyscope. On June 12, 1817 Karlsruhe-born German forest official Karl Freiherr von Drais (Karl Friedrich Christian Ludwig Freiheirr Drais von Sauerbronn) (1785-1851) demonstrates the ballbreaker Draisienne (AKA Laufmaschine, Draisine, Dandy Horse) in Mannheim, a 2-wheeled bicycle sans pedals that you walk on, becoming the first 2-wheeler vehicle, archetype of the bicycle; too bad, after it catches on and riders begin using the sidewalks and harassing pedestrians, it is banned in Germany, England, U.S., and Calcutta. In 1839 the Velocipede, a Draisienne with pedals on the rear wheels (first true bicycle) is invented by Scottish blacksmith Kirkpatrick Macmillan (1810-78). In 1861 Ernest Michaux (1842-82) and his brother Pierre Michaux (1813-83) of Bar-le-duc, France invent the front wheel-driven Velocipede, the first true bicycle with pedals and cranks; it is called the boneshaker since it has steel tires and no springs; they sell 142 cycles next year, making it the first mass-produced bike. 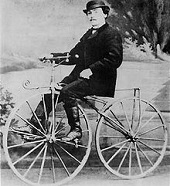 On Nov. 20, 1866 French mechanic Pierre Lallement (1843-91) is awarded the first U.S. patent on a pedal bicycle. On May 30, 1880 the League of Am. Wheelmen is founded in Newport, R.I., becoming the first U.S. nat. bicycle society, with membership peaking at 103K in 1898, declining to 8,692 in 1902, when it dissolves until 1942, reaching 614 members in 1945 before dissolving again in 1955, after which it reorganizes in 1965, changing its name to the League of Am. Bicyclists in 1994, and peaking at 24K members in 1997. In 1892 Harry Dacre (Frank Dean) (1857-1922) pub. the song Daisy Bell (Bicycle Built for Two), with the chorus: "Daisy, Daisy/ Give me your answer, do/ I'm half crazy/ all for the love of you"; it becomes the first song sung via computer speech synthesis in the 1968 film "2001: A Space Odyssey". In 1901 French bicyclist Paul de Vivie (1853-1930) AKA Velocio begins perfecting the Derailleur (which may have already existed in Britain? ), causing him to become known as the Father of Bicycle Touring. On May 31-July 5, 1903 after Marquis Jules Albert de Dion (1846-1946) founds the newspaper L'Auto to compete with Pierre Giffard's leading sports newspaper Le Velo (1892-1904) because of a feud over the Dreyfus Affair, and needs to boost circ. with a publicity stunt, the Tour de France cycling race is organized by French cyclist and journalist Henri Desgrange (1865-1940), ed. of L'Auto, who models the maillot jaune after Grenoble; the winner is Maurice-Francois Garin (1871-1957), who finishes the six stages in 93h 33m 14s at an avg. speed of 15.96 mph (25.68 km/h). On Apr. 30-Dec. 1, 1904 the St. Louis World's Fair (Louisiana Purchase Exhibition) is held in commemoration of the centennial of the Louisiana Purchase a year late, and 20M visitors attend it; cotton candy and Dr. Pepper are introduced; on Apr. 30 Pres. Roosevelt presses a telegraph key at the White House to signal its official start; it costs $31K a day to run, and features the Gateway to the West Arch, designed by Finnish-born Eero Saarinen (1910-61) NOT (wait till 1968); iced tea, invented by plantation owner Richard Blechynden, and peanut butter, provided by C.H. Sumner, along with the Egyptian fan dancer are the hits of the fair; Geronimo appears at the fair; on July 1-Nov. 23 the Third (3rd) (III) Summer Olympic Games are held as part of the fair (first Olympics held in the U.S.), with 651 athletes (incl. 6 women) from 12 countries competing in 94 events, with the Russo-Japanese War and the remote location keeping most of the top athletes from attending; boxing, weightlifting, freestyle wrestling, and decathlon debut; on Aug. 12-13 "Anthropology Days" are held to pit aborigines from around the world with white men for curious anthropologists; James Davies "Jim" Lightbody (1882-1953) of the U.S. wins golds in the 800m and 1.5km (world record) and steeplechase, and silver in the 4 mi. team event; U.S. gymnast George Eyser (1871-?) wins six medals despite a wooden left leg; Emil A. Rausch (1882-1954) of Germany wins two golds and a bronze in swimming, becoming the last man to win an Olympic gold in sidestroke; Columbia U. basketball star Marcus Latimer Hurley (1883-1941) of the U.S. wins four golds in cycling, and bronze in the 2-mi. race; Beals C. Wright (1879-1961) of the U.S. wins golds in singles and doubles tennis; the marathon is run in dusty hot weather, and is a clown show, with the accompanying vehicles kicking up dust; Frederick "Fred" Lorz (1883-1914) is declared the winner until it is found he only ran 9 mi., got in a car, then got back out with 5 mi. 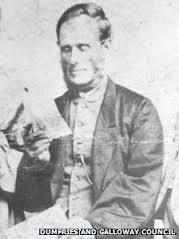 to go, and is banned for 1 year by the AAU, winning the Boston Marathon next year; Cuban postman Felix de la Caridad Carvajal y Soto (Andarin Carvajal) (1875-1949) (who runs in cut-off pants) stops in an orchard and eats rotten apples, causing him to get sick and take a nap, after which he comes in 4th; South African Tswana tribesmen Len Tau (Taunyane) and Yamasani (Jan Mashiani) become the first black Africans to compete in the Olympics, coming in 9th and 12th, although Tau was chased 1 mi. off-course by dogs; the winner is British-born Thomas J. Hicks (1875-1963) of the U.S. (winner of the 1904 Boston Marathon), who was given two doses of 1 mg. of strychnine sulfate mixed with brandy by his trainers to revive him; too bad, only 42 events have athletes not from the U.S., causing the all-U.S. events to be combined with U.S. championships, and most of the real Olympic events are held on Aug. 29-Sept. 3; the whole thing is such a joke that new (intercalated) games are arranged for 1906 in Athens; on July 23 the ice cream cone is allegedly invented by money-money-money Charles E. Menches during the fair when his girlfriend rolls one of the layers of an ice cream sandwich around some flowers; either that, or Syrian zalabia (waffle) seller Earnest A. Hamwi suggests using his product. On Mar. 26-31, 1909 the first 6-day Berlin Bicycle Race in Germany is held.